A bedroom remodel is fairly fundamental. Most everyone has done something to the bedroom to make it their own, whether it’s as simple as a new paint job and hanging a new light fixture, or as complex as blowing out a closet or wall to make a master suite of an entire floor. For me, tackling this master bedroom project meant creating a space that makes sense for living in this century—a handy feature for a house built in 1905. Old houses are tough enough to work on, but this old bird was (I’d like to say “lovingly remodeled,” but that would be deceitful) was remuddled some 75 years later. And by “remuddled” I mean That 70’s Show style hit this house like an out-of-control freight train, complete with accents of wood paneling and pink shag carpet throughout. Upgrading this bedroom to meet such high-brow standards as un-cracked plaster walls and ceilings, along with suitable clothes storage (there was no closet in this bad boy), required blowing out a neighboring room’s closet to add square-footage. I also upgraded all the electrical from the haphazard knob-and-tube to 21st Century specs. All this was to reach the ultimate goal of creating a remodel-free sanctuary while the rest of the house undergoes its growing pains on its way to a second life in modernity. This master bedroom is a gut-job. Nothing is worth keeping. The plaster has long-since over-served its duty and has been trying to retire to the floor—without a lick of encouragement from a wrecking bar I might add—for at least a decade. The windows refuse to stay open without special assistance from a book or scrap of lumber. The electrical knob-and-tube is like an active volcano waiting to light. The trim looks like it was cut during a blind-folded dare. And the insulation is like believing in a Santa Claus: I like to think that it exists, but it doesn’t. The walls are just simple, sturdy ol’ terra cotta block with plaster-on-lath. Not a high R-value here. And you don’t have to know anything about remodeling to catch this fastball: I just don’t think pink works for an adult’s bedroom. Once we settled on a realistic scope of work and a proper budget, I couldn’t wait to start smashing out the mangy pink walls. But, planning precedes smashing, despite the spike in my blood pressure when I got clearance to have at it. 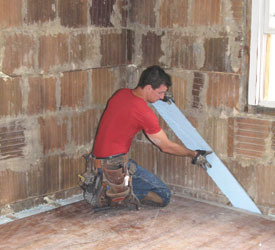 You may be thinking, why doesn’t he just sheet the entire room in drywall? Wouldn’t that save a whole pile of time and money? No and yes. Time. It would actually be more of a hassle to work around the current state of affairs. 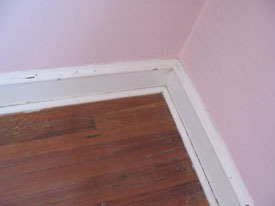 Laminating drywall on top of bad plaster would trap substandard wiring under a new finish and leave the HVAC system sucking wind like it was breathing through a straw. Not only would it have been not right, it would have been seriously wrong—and not safe. Money. It does cost more out-of-pocket to do things the right way, but the amount of time saved from not spending hours jimmy-ing around with seriously PITA carpentry (you figure out that acronym) like tiny jamb extensions and/or re-hanging the door combined with bringing out the brittle, cloth-jacketed wires to the new drywall plane, I will actually save money in labor cost. 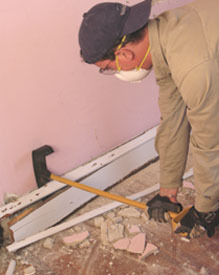 The biggest benefit to stripping the room back to block: The room can be insulated and a proper tie-in can be made to the HVAC system. That’s a big bonus for a house that’s never had any—and the project is ultimately cheaper to own over the long haul. ‘Nuf said. 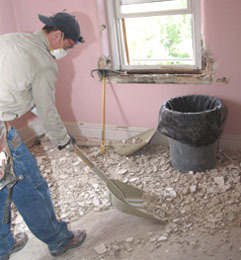 Tearing out plaster isn’t something I do every day, but it’s hardly new to me either. 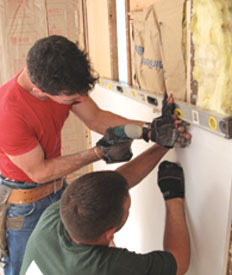 With all remodeling projects, there’s always some nuance behind the sheathing. And I always expect a little surprise that some previous tradesman thoughtfully (or, more likely, thoughtlessly) left behind. To make haste on this project I reached for a few new tools to help speed up tear-down. Ruggedly ready. I’ve never found any reason to wear anything that’s been purchased in the last decade during a demo job—until now. Don’t get me wrong. When I’m walking around my customers’ houses, I try to keep a workmanlike, yet professional, appearance. So, I decided to try out a button-down shirt from RIGGS Workwear for demo, and I’m glad I did. Demo is sweat-factory work. Wearing the long-sleeve RIGGS layer over a short-sleeve layer kept me cool (okay, cooler) and as free of debris as possible during total rip-out. And the cotton fabric is rugged but not stiff, so I can move (www.RiggsWorkWear.com). No matter what you decide to sheath your body in during demo jobs, it’s important to remember to wear eye protection and gloves. You never know what might fling back at you while you are tearing the walls down. And get good dust masks while you’re at it. Ripped and wrecked. The other new tool on the project was a set of three Demo Dawg wrecking bars (www.DemoDawg.com). If you’ve used wrecking bars, you’ll know that not all perform the same. 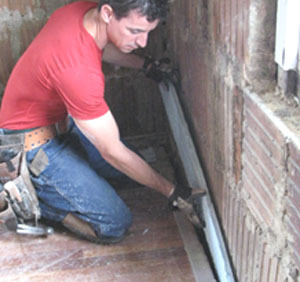 The bars from Demo Dawg have sharp, wide and flat prying heads that are ideal for plunging behind trim or into plaster and lath, enabling the wide head to release a large swath of plaster for faster progress. Bag it. Ever since I read a book about trash—Gone Tomorrow, The Hidden Life of Garbage—my first inclination is to use anything re-usable. It’s not necessarily because of global warming, it’s just that I don’t like adding to the growing pile of waste on the planet. On this job I didn’t have the option of renting a dumpster. Instead, I had to bag up the detritus and lug it out like Santa doing sidework. I suggest using DemoBags (www.DemoBags.com). They’re re-usable, bulletproof, and—I like this—even when you have to dump them, they decay at a much faster rate (according to the company) than your basic black plastic deals. Sweet. After I had the right work gear, the right tools, and a place to put all of the debris, it was time to start the fun part: Shredding the room back to block. 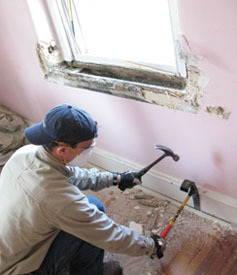 Starting with the walls and then moving to the ceiling, I ripped the decaying plaster to its final resting place inside the trash bags. The ceiling was a special case. It’s the only place that had insulation in the house (rock wool packed the bays) so instead of taking it all down (and taking a shower in rock wool) I left the lath but took the plaster. The best tool for the job was a simple, square edged garden spade. While perched on a rolling scaffold, I was able to delaminate the plaster from the lath with no damage—while saving the existing insulation. The last step for demo was to rip up floor boards (there was no subfloor here) to gain access to the floor joist bays for insulation later on. Floor-joist Bays. 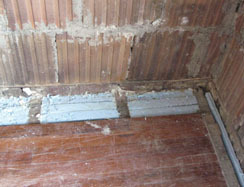 Insulation wasn’t a top priority when this house was built a century ago. And while it’s much more talked about now, there’s still a much-overlooked spot that is a source of heat loss and a cause of cold floors. I’m talking about floor-joist bays along a house’s perimeter. 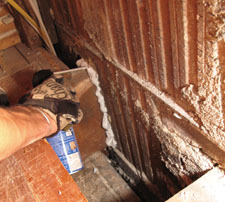 While it’s possible to just pack the bays with R-30 fiberglass batts (Tip: It’s smart to do this in a basement’s joist bays to keep a first floor warmer; I install one batt vertically against the outside wall, then another installed horizontally 24 inches into the bay), instead I chose three layers of Dow R-11 rigid Styrofoam. This saved time, because I didn’t have to remove very many floor boards. I could also adhere the rigid cubes to the block wall and then seal around them with DAP low-expanding foam. And where I had to sneak the chase through the existing floor system, I could put half a layer of foam (you can halve the pieces using a handsaw—I use a Stiletto brand for this; it’s awesome) to get an R-5-ish panel. That’ll help knock down cold air without sacrificing too many cubic inches of airflow. Then I stuffed the joist bay on the interior side of the chase. 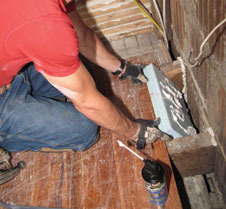 This really sealed up the joists nicely. Along the wall running parallel with the joists, I was able to rip more sheets of Styrofoam into pieces I could wedge between a joist that was about an inch off the block. I then sealed off this area with Great Stuff spray foam. There’d be no way I could stuff fiberglass down in this gap, and if I sprayed it entirely with Great Stuff (which would have worked) it would have taken a long time and a zillion cans of goop. Sound work. 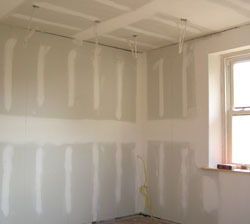 Between adjoining rooms, I ripped sheets of Styrofoam at full thickness to fit between the studs. I could have used sound deadening batts, but there were a couple of challenges: First, the bays were a full 2-by-3 so the batts (at 3-1/2 inches) would have been slightly overstuffed. Second, studs (like the floor joists) were randomly spaced so each panel had to be cut. Sawing through the rigid panels is a snap, so they went in quickly and snugly. I was left with all kinds of cut-offs from the rigid foam, so I used them over windows and in other areas instead of batts. Nothing went to waste, which I like. In essence, I was building a new room from scratch, so I framed just as if I were building a new house by pulling all of my layout lines from one corner. Framing was pretty straightforward. The only thing to point out is that instead of tripled-up framing in the corners to create a nailing surface for drywall, I use “chicken ladders”—blocking cut like ladder rungs—to create the nailing surface and a cavity I could insulate (wood is not a great insulator). But, because I had to weave in an HVAC return chase through the existing floor joists (spaced randomly), I paid special attention to where the chase laid out and moved studs accordingly to save myself backpedaling later on. Also, I had to be sure none of the new electrical ran through the planned HVAC chase, so I made sure to lay out all of these plans well ahead of time with my electrician. Scheduling is critical on every project. It’s hard to avoid surprises, but it’s also important to try to make a master schedule so work is completed when it makes sense, and is scheduled at a point when it’s easiest for each trade to complete their work. 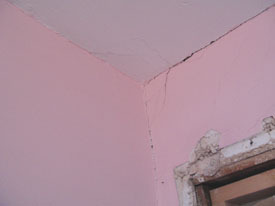 That’s why I felt lucky when my electrician was able to do the rough-in before I started full-bore insulation. And I know he appreciates that he could just go ahead and pull all the wires and place all the device boxes without having to wire around insulation. Not only would that have made him feel less pleased with me as a client, the hassle would jump up his hours, and my bill, too. 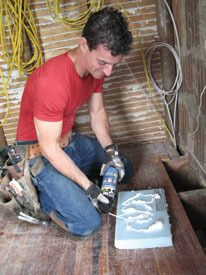 After the electrical was roughed-in, packing the bays with R-13 fiberglass batts was a snap. Don’t squeeze me in. 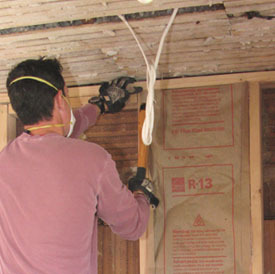 Insulation is supposed to be fluffy, not vacuum-sealed into the walls. If you cram it in, you’ll get lower thermal performance. It’s the air pockets inside the pink fluffy matter—not the pick fluffy stuff itself—that really does the work of trapping heat, and keeping your house at your desired temperature. Compressing the insulation chokes off layers of those little air pockets. To keep the insulation fluffy in these bedroom walls, I carefully notched it around electrical devices rather than simply stuffing the full batts around a box or around any blocking. For wires, it’s best to slice the insulation up the middle and wrap the wire (like a sandwich) rather than jam it behind—or in front of—the wire. 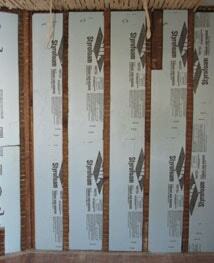 I reached for my hammer tacker to secure the paper ears on the batts of insulation to the surrounding framing. It’s important not to move randomly around the batt, and to start at a fixed point when affixing the insulation. I like to start at the top and work my way down. This way the batt doesn’t sag while I’m tacking it in place, preventing a possible gap between the top of the stud bay and bottom of the top plate. I like to hang rock myself when possible and profitable. The main benefit is that I can control the amount of bulk material moving through a home while—hopefully—avoiding any possible damage to other finished spaces along the way. 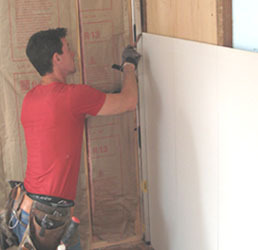 Finishing the drywall is another story. While I’m pretty good at getting a nice smooth seamless-looking finish, my subs can do an impeccable job somewhere on the order of a thousand times faster and better than I can. And using subs doesn’t hurt my bottom line at all. I’m freed-up to move other parts of my projects forward, so in the end, I actually save money on the job by working at high-efficiency. Insulating walls is great, but if the windows are leaking like sieves, you’ve still got huge energy problems and an investment into a Swiss cheese palace. So, the last phase of tightening the building seal is replacing the two windows with new vinyl replacements. I’ve picked out a window with a Low-E coating and argon gas between the glass. Instead of bright white, I’m going for Simonton’s new Driftwood color, which will give a nice contrast tot the eventual high-gloss white trim around the windows. And while the windows will save energy costs throughout the year, they also have the neat upgrade not included in the originals—they can stay open without any special rigging.